Virgin never used, out of production, rare, out of the box Blue Bowl from Foster’s Grill Store. New ash sweeps, metal table, custom blond oak handle, new grate, third generation frame. She came to me in good physical shape. Solid frame, a few minor scrapes around the rim on the lid but in need of a deep cleaning. So she’s in pretty good shape other than a ton of pollen and a dirty bowl. For the most part she simply needs a good douching. Need some Back to Black to brighten up the frame and wheels. When I first looked at the table it looked like it was badly stained but much of the dark marks that were visible wiped right off. Chicken thighs/ smashed red bliss potatoes using the Upper Deck for increased offset cooking space. Our buddy Anthony Caturano At Tonno took the second SS Performer. Immediately I had a empty pit in my stomach, without a Performer to cook on at the dock. Truth be told I really enjoy the restoration process and needed another project so I searched out another Performer looking for some love. 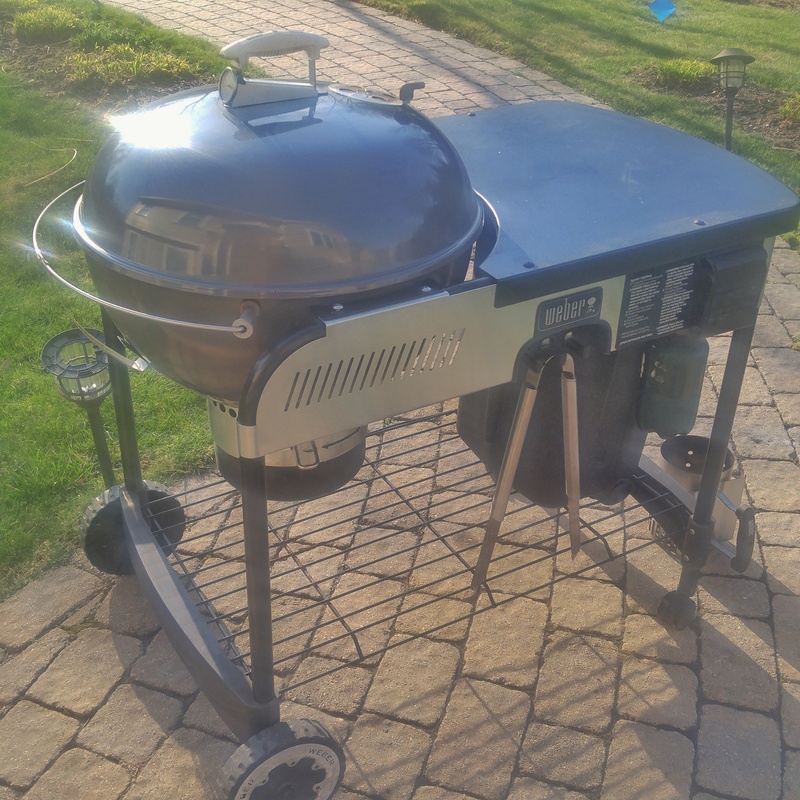 It’s a second generation Weber Performer. Each of the Generations of the Performers have things I like about them. The Wheels on the third Generation. The Black Metal table on the fourth generation. (This is actually my 3rd gen with a 4th gen table. And here is the latest- The DR Code Green, should clean up nicely. When the light comes I’ll test the gas assist to see if it’s working. With or without the gas assist I love the functionality of the attached table and bin on the Performers.